Find out what practical jokes workers have pulled in their office--and how to avoid taking your tricks too far. Are you and your co-workers meticulously planning your ideal April Fools' prank? You're not alone. Despite the fact that the lighthearted holiday falls on a Sunday this year, a Monster.com survey says one in three workers plans to play an April Fools' joke on a fellow employee. If you're looking for some inspiration, we've compiled our 10 favorite office hi-jinks. But before pulling your prank, be sure to review the guidelines from business etiquette expert Pamela J. Holland for what's workplace appropriate. Prank #1: Foiled Again . and Again and Again. 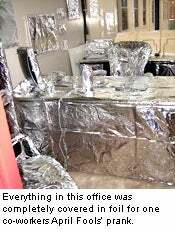 The Mission: Creative guru Casto decided to "foil" a co-worker while he was out of town on business. Despite inclement weather, including a tornado warning, nothing was going to stop Casto from wrapping every single item in the co-worker's office in aluminum foil. The mission, which required two industrial-size rolls of foil, took three people an hour and a half to pull off. Prank #2: What's Wrong With My Mouse? The Mission: Ostergaard's joke is pretty simple to set up, but it managed to stump his IT technician. Ostergaard placed a small Post-It note with the words "April Fools!" written on it underneath his co-worker's mouse. When the technician attempted to use it, the track ball was ineffective. After about 10 minutes, he finally figured it out. The Mission: While working at Hewlett-Packard, Boyd's manager, Mark, always had a jar of M&Ms on his desk that he'd dive into every day. One of Boyd's co-workers, Bill, was known for being rather anti-social and grouchy, so one April Fools' Day, they decided to play a joke on him. As soon as Bill got up from his desk, Boyd and her cohorts stole the jar of M&Ms from Mark's desk and left a trail of chocolate on the floor leading to Bill's desk and hid the nearly empty jar in Bill's credenza. Mark returned to his office and immediately noticed his M&Ms were missing. He followed the long trail through the rows of desks to where Bill was sitting. When he opened Bill's credenza and found the jar, Bill was shocked, but his fellow employees got quite a laugh. The Mission: This covert plan hasn't happened yet--but it's set to go for this Monday, April 2. Brand and her co-workers are planning to pull a prank on their boss. Everyone plans on calling in with some type of excuse, leaving an empty office. The best part of the trick: A new hire is scheduled to start that day. But they won't be leaving the two alone for long. The co-workers plan on meeting at a local bakery to pick up breakfast for their boss before showing up at the office at the same time to say, "April Fools!" Prank #5: A Joke That Ends with "I Quit!" The Mission: When Vandy Kindred, partner and creative director for advertising and public relations firm Dave Syferd & Partners went on vacation, he had no idea what he'd be coming back to. The day before he planned on returning, employees banded together to move the contents of his office into a small cubicle. Instead of leaving his former office empty, they set it up for the president of a company who leased cubicle space from them. When Kindred stepped into his former office the next day, he was instantly baffled by the new arrangement. After asking co-workers what was going on, they escorted him to his small cubicle, and he angrily fled the office. Instead of allowing the company to demote him, Kindred decided to drive to Canada and become a park ranger. When his fellow employees hadn't heard from him for a few hours, they called him since he was expected to record audio for a client. Kindred was already sitting in line to cross into Canada, but decided to return to work in Seattle after an employee explained the joke. The Mission: While William Malek was in technical service representative training, he had to leave the office for two weeks to fly back to Stanford and wrap up some teaching engagements. While he was away, the rest of the training class at PrintingForLess.com got together and ran all of his equipment, including his mouse, computer screen, keyboard and phone through their shrink wrapping machine in the bindery. Pranksters: The employees at WRBV-TV, as told by Brian Eckert, former program director and production manager at the station. He's now the director of Media and Public Relations at the University of Richmond. The Mission: Eckert was out of the office the afternoon before April Fools' Day about 20 years ago. He and his co-workers had been involved in an escalating series of practical jokes. In his absence, his fellow employees got the key to his office and turned everything upside down, including the furniture, papers and office equipment. Unbeknownst to them, Eckert arrived unusually early the next day. He was stunned at what they'd done but decided to one-up their stunt. So he turned everything right-side up and left the office to get coffee before everyone arrived. When he got back, he unlocked his office and walked in like normal, pretending not to know what happened as they peeked into his office with confused looks on their faces. Unless they're reading this now, Eckert says they still don't know what went wrong with their April Fools' Day stunt. 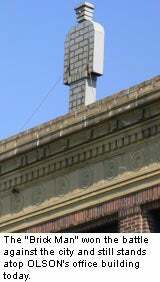 The Mission: Advertising agency OLSON was in the middle of a dispute with the city concerning a 10-foot-tall brick statue atop their office building. Officials had asked the statue be removed, however OLSON argued the "Brick Man" was both their icon and a piece of art. Hoping to get CEO John Olson fired up about the dispute, Engebretson left Olson a stern message from his own cell phone, disguising his voice and warning him that the agency was being fined $400 for each day that passed since their violation notice, which at that point totaled $12,000. Olson panicked and called the agency's COO. After hearing her advice, he called the number back, but Engebretson was on another call with a client so couldn't answer. The call went to voicemail, and Olson discovered the prank. Though he sprinted toward Engebretson's desk red-faced and head shaking, they all got a good laugh out of it. OLSON won the battle, and the "Brick Man" remains on the rooftop to this day. Prank #9: Is That Your Final Answer? Pranksters: Kimberly Hassler, former copy writer, along with co-worker Jeff White. Hassler is now a writer with Lehigh Valley Hospital and Health Networks in Allentown, Pennsylvania. The Mission: The senior copy writer at Lieberman-Appalucci, John, wanted to be on Who Wants to be a Millionaire in the worst way. He told White he had qualified for the show the night before when he called an 800-number and was anticipating a call that day. He warned the receptionist to page him if anyone called and no matter what, not to put any calls into his voice mail. White lured John away from his desk, while Hassler, a regular prankster, placed a fake call to him saying she was a producer with the show and would like him to call back. When John returned to his office, he saw he had a message and was annoyed with the receptionist. He frantically punched the number into his phone (which was the real number to ABC Studios in New York) and told the person who answered what he was calling about and was put on hold. Meanwhile, Hassler walked into his office and asked if she could have a month off from work to travel. When he said no, she asked, "Is that your final answer?" When he said yes, she asked again, and he realized what she was doing. Pranksters: Jeff Hardison, former account executive, along with co-worker Nate James. Hardison is now employed with McClenahan Bruer Communications, based in Portland, Oregon. The Mission: Around April 1, 2000, different teams within Hardison's former company were hiring so many new employees that the current ones were growing upset by all the new faces they didn't have a role in approving. So Hardison and co-worker, James, worked with their IT administrator to create a fake e-mail address for a "new intern" named something like Jessica Benet Ramsfeld. They sent out an e-mail to the entire company from her address, laden with misspellings and teenage slang. The scenario: Since "Jessica's" supervisors were out of the office for her first day, she ended up having to send out a news release about a new ice cream flavor for their gourmet food client. The ice cream flavor was going to be called "Spirit Cow" in honor of the Dalai Lama's visit. They attached a horribly written news release about the ice cream, with "Jessica" explaining that the release had already crossed the wire. People flipped--especially new employees who felt threatened. It may start out as fun and games, but there's always the occasional prank that goes a bit too far, resulting in a firing or even a lawsuit. Pamela J. Holland, COO of BRODY Professional Development in Jenkintown, Pennsylvania, says there's a balance to having some fun with your fellow employees and crossing moral and ethical boundaries. "People need to be very careful about office pranks. While I am a firm believer in the benefits of humor and laughter in the workplace, people should really think about what they're doing before they do it," advises Holland. Make sure it doesn't embarrass someone or cause disruption in the workplace. Think through all possible consequences of the joke. Don't use April Fools' Day as an opportunity to "get back" at someone you don't like. What's OK to do at home with family or friends may not be appropriate for the workplace. If your boss is the subject of your prank, be extremely careful. You need to know this person extremely well, understand their sense of humor and never do anything that would diminish your boss's authority.